The Knoxville City Council passed on first reading Mayor Rogero’s proposed budget during its meeting Tuesday night. The officials heard reports from the Historic Zoning Commission about saving historic properties and from Kim Trent, of Knox Heritage, about such efforts and her intentions to release the new “Endangered 15” list next week. The council also adopted a resolution setting electric standards for food trucks. Vice Mayor Duane Grieve told the council he will introduce a resolution soon to move the meetings from 7 p.m. to 5 p.m. and hold the Beer Board meeting at 4 p.m., probably starting in July. 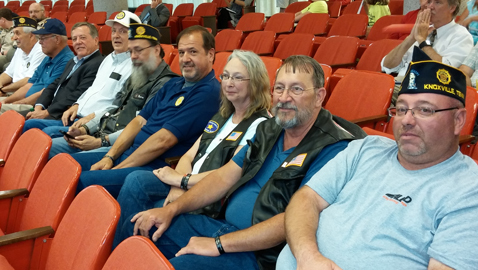 But much of the meeting was spent hearing from American Legion Post 2 on a rezoning request for their facility on South Ruggles Ferry Pike just off of Asheville Highway. The members want to sell their building, a former school, in order to move closer to town. The post had approached the planning commission to request a C-3 commercial zoning to allow the potential buyer, John Coker, to operate an auction house there. The MPC voted to zone the property for office use because of the surrounding residential area. Attorney Arthur Seymour, Jr., representing the Legion, asked the council to refer the matter back to the planning committee where the request will be modified to C-4, which would permit the operation of an auction there. Coker said the site, atop the hill overlooking Asheville Highway, is “ideal for an auction” because of the auditorium there and the large parking lot. Marty Everett, Commander of the Legion, said the Patton Tank there will be moved and said the sale will permit the post to find a more central Knoxville location. Currently the legion has more than 700 members. MPC Director Gerald Green told the council that changing the zoning to C-4 would open up the area to commercial development and, once zoned, the property could be used in the future for things like an automobile sales lot. He said that even if the buyer agreed to a covenant about the use there the MPC could not hold him or future owners to it. The council agreed to send the request back to the planning commission for consideration of the zoning change. In other action the council passed, as an emergency ordinance, the rezoning of a lot on the corner of South Baker and Moody Avenues to “OS-2” Parks and Open Space. Councilman Nick Pavlis said the lot may be used for parking at the old school there, now the Cecil Webb Recreation Center. The council also heard from residents on Sheffield Drive who were demanding the sidewalks they say were promised years ago when annexed into the city. “It is not a county road anymore,” said one resident. The council also approved funding a contract for the operation of sound equipment at Market Square events, funding of a portable ice rink for Christmas in the City, approved 24 requests for wine sales permits and funded the Office of Neighborhood grants to various neighborhood groups.